I like to at least post something once a week, but I’ve been a bit occupied lately. 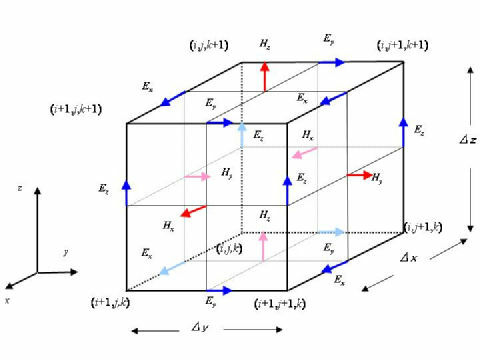 I suppose I could be sharing my latest philosophical thoughts, or ranting on about politics, but for the past few weeks I’ve mainly been studying numerical methods for simulating electromagnetic radiation and have been building some really neat 3D simulations. Behold, a screenshot from my latest creation. 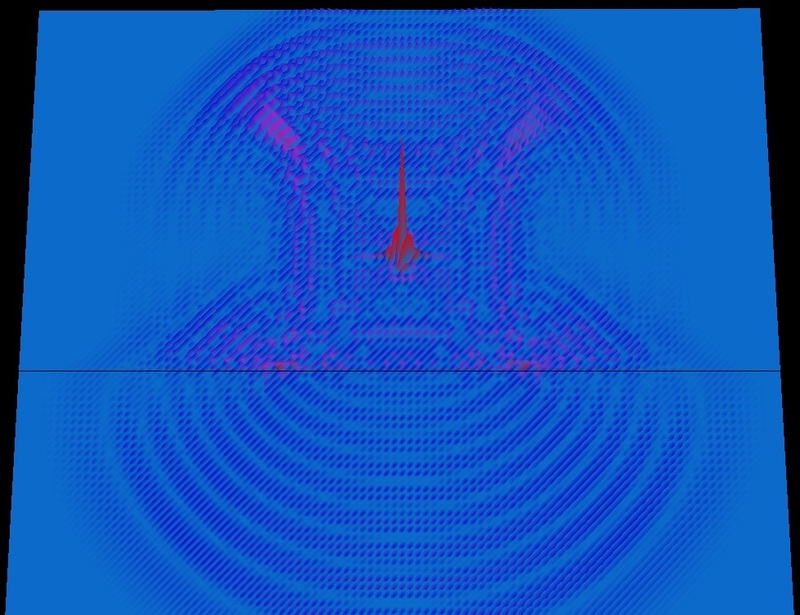 It’s a simulation of electromagnetic radiation, produced by shaking an electron within glass, releasing 700 nm waves. If you were standing outside this piece of glass looking in, you’d see a small red flash of light. This is actually a full simulation of Maxwell’s equations, with no simplifications. The wave makes its way through the glass toward the edge, which is the border between it and an empty vacuum. We see the light bends outward, being mostly transmitted, but partially reflected. Notice how the wave speed changes between mediums. As for the big red spike, that’s a sort of marker for the source. Those equations there are roughly what are being simulated, but in my simulator, there’s no need for the mediums to be linear. I can simulate complex materials with all kinds of intricate behavior. I’ve never done this, but it would be pretty neat to simulate an eyeball as literal flesh and fluid, watching makes its way toward the retina. 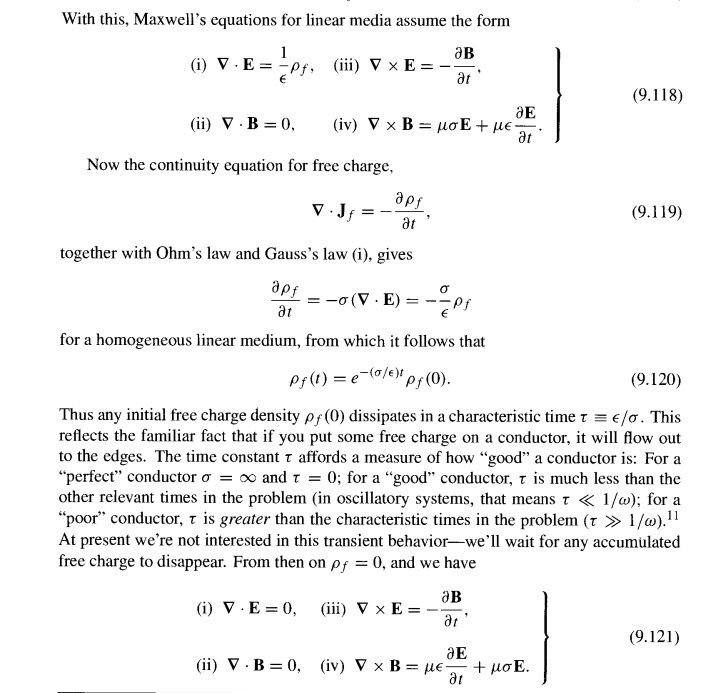 The computational electrodynamics textbook I’ve been reading shows how, but I haven’t done it yet. A lot of research takes place seeing how radiation from cell phones affects the brain, chemotherapy, and so on. It’s neat stuff. Computers allow you to look at very complicated situations, and that’s what interests me. As I sit here doing research on my own, I’m in a little paradise. There’s so many everyday things around me I want to simulate. There’s all these wonderful microscopic processes taking place all around me and it feels good to understand what’s going on. We have all these tiny three dimensional cubes of electric and magnetic fields working on each other, propagating the wave through space. My simulator solves all six differential equations to find each component of both the electric and magnetic fields. When I look up at the night sky and see the stars, I see myself immersed in a giant grid of these little cubes “conducting” the light waves through millions, or even billions of light years of space. When you learn what those weird looking math symbols mean, amazing pictures start unfurling in your mind. The world around you becomes very complicated, and you see this vast machine in operation. Right now I’m working on simulating waveguides. I’ve been shooting electromagnetic waves in various directions, watching them bend around objects, and so forth. It’s pretty cool to fire monochromatic light at a little sphere and watch the interference patterns unfold on their own. I’m mostly interested in deeply understanding everyday things around me. Like light bouncing off of things, fluid flow as I heat up a cup of coffee, or two atoms binding together using quantum chemistry. I think if you probe deeply enough, you’ll find the secrets of the cosmos in the most mundane events around you. That’s because nothing’s mundane if you get what’s going on. Next Next post: Will Things Get Better?